As discussed recently over at FasterSkier, Brooks just missed qualifying via objective criteria, as she finished 55th in the World Cup overall. That means that if she’s named, it will have to be based upon some discretionary judgement by the coaches. I think you can make a pretty good case that Brooks deserves a spot. This doesn’t make her look very good, although she still comes out looking pretty favorably compared to Sargent and even Stephen, to a certain degree. But as we all know, Brooks broke her wrist over Christmas, and then proceeded to race through the injury for several weeks. What does her season look like if we drop her post-injury results? 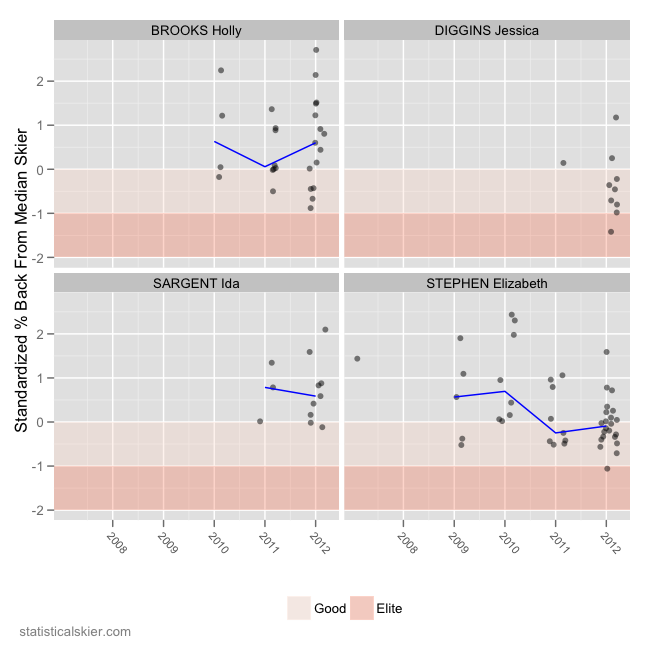 That looks to me like an athlete performing roughly on par with Jessie Diggins (who qualified for the A team via objective criteria), better than Sargent, and showing stronger improvements year-to-year than Stephen (who, I might add, is considerably younger than Brooks). 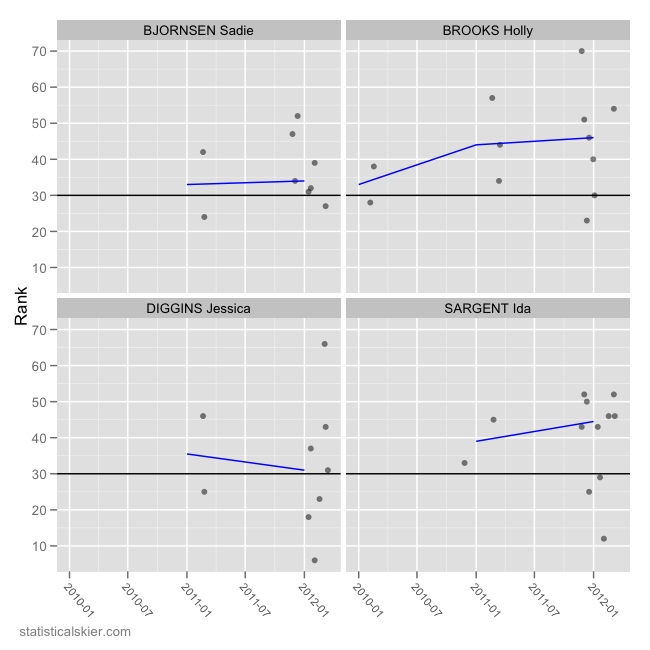 I omitted Sadie Bjornsen from these plots for space reasons, but that comparison is basically the same as between Brooks and Sargent. If you omit Brooks’ post injury sprints she’s left with only a 23rd and a 46th, which is sort of a wash, in my opinion. Particularly compared to these other women, I don’t think you’d be adding Brooks for her sprinting. Any success in these events would be a bonus. But consider that her pre-injury distance results this season were 13th, 17th, 19th, 22nd and 36th. Even if she had spent much of the remainder of the season in the 20s rather than the teens, so at the low end of what she was doing pre-injury, she’d have been a shoe-in for making the A team on objective criteria alone. Also, it may be worth considering how much better prepared she might be for WSCs racing in Europe rather than domestically. And really, barring some catastrophic collapse there’s just no way I can see her not going to WSCs next year. I mean, raise your hand if you want to see what a relay team of Randall, Brooks, Diggins and Stephen could do? A long shot, perhaps, but with Brooks there you really do have a shot at a significant result in the relay. And if you have all four of them on the WC circuit more or less full time, they’d get two solid dry runs at the relay before WSCs. 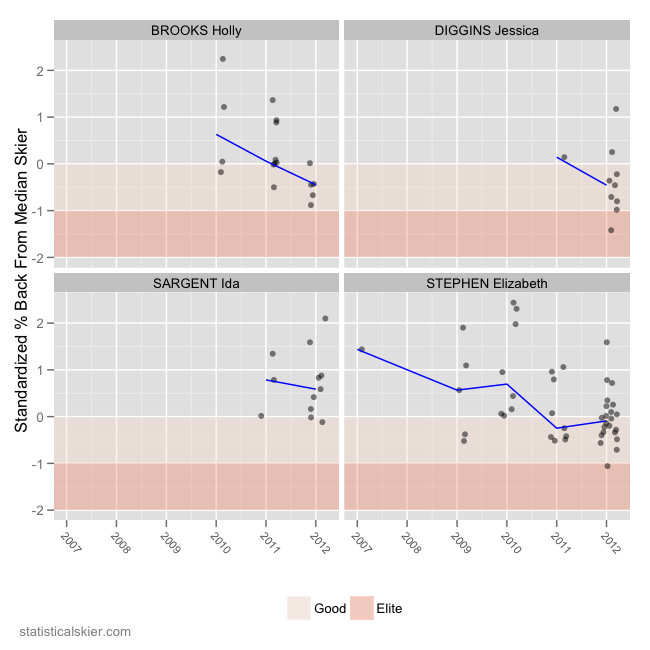 Her results suggest that an injury free season could have shown her to be equal to, or better than, both Diggins and Stephen. I want her at WSCs, particularly to complete our relay team. I want her to be prepared for WSCs, and I’m skeptical that racing domestically and then jetting over to Europe just for WSCs is optimal. Obviously, this is just me. And I don’t have to deal with any of the financial realities of the situation, so that makes this a much easier call for me to make. But I think that in this case Brooks’ potential for consistent top 30 results (even if its only for 1-2 seasons, given her age) is worth making an exception to the US team’s general policy of favoring younger, developing athletes. Posted by Joran on Monday, May 7, 2012, at 6:00 am. Filed under Analysis, Cross Country. Tagged holly brooks, selection criteria, usst. Follow any responses to this post with its comments RSS feed. You can post a comment or trackback from your blog.